The historic Uffizi Gallery in Florence partnered with Indiana University informatics and art history students and faculty to undertake the five-year project. Old Masters enthusiasts will now be able to pore through the expansive collection of the Uffizi Gallery in Florence, Italy from the comfort of their own home. 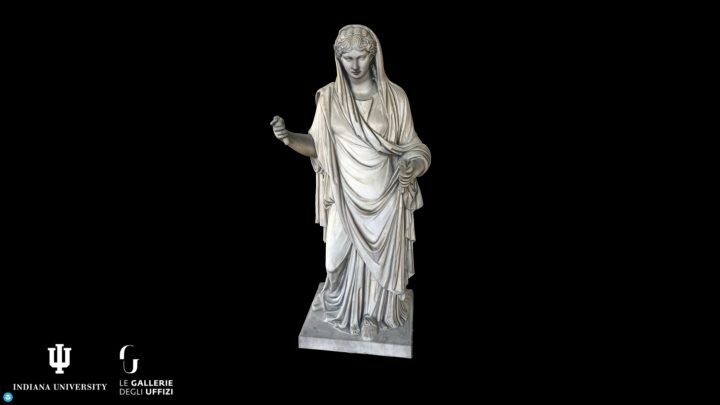 Thanks to a collaboration between the eminent Italian gallery and Indiana University (IU), a collection of over 300 digitized ancient sculptures and fragments are available as interactive three-dimensional scans. The website was unveiled last Tuesday, August 7, to an eager public. The Uffizi Digitization Project was undertaken by the Virtual World Heritage Laboratory in the Indiana University School of Informatics and Computing, collaborating with the Politecnico di Milano and the University of Florence. They intend to digitize the complete collection of Greek and Roman sculpture in the Uffizi, Pitti Palace, and Boboli Gardens, a collection largely assembled by the Medici family between the 15th and 18th centuries. The venture was announced in 2016, and the endeavor will span five years as digitization continues. The institutions say they are about halfway complete, planning to finish the project in 2020. The operating team includes a group of IU informatics and art history students, being trained in 3D data capture, digital modeling, and interactive online publication. The group was led by Bernard Frischer, IU professor of informatics and director of the university’s Virtual World Heritage Laboratory, with fundamental assistance from Politecnico di Milano professor Gabriele Guidi. The genuinely easy-to-navigate website proves more interactive than many computerized museum archives. Users are given the opportunity to travel inside tombs and inside every nook of the figures’ construction. The interface allows users to travel around and within the sculptures, getting closer than visitors often can in the museum space itself thanks to three-dimensional rendering from every imaginable angle. The monumental Uffizi Gallery, built between 1560 and 1580 and designed by Giorgio Vasari, boasts an enormous collection of Renaissance and ancient artworks. It currently hosts the famous “Birth of Venus” by Sandro Botticelli, and “Madonna of the Goldfinch” by Raffaello Sanzio, among other world-renowned masterpieces by artists like Caravaggio, Michelangelo, and Raphael.